User-Friendly Doesn’t Happen by Accident. New usability lab helps companies offer easy-to-use products and services. The historic Harrisburg Train Station might be the last place you’d expect to find new technology. However, just last month, Red Privet opened a new usability lab on the second floor, next door to our design studio and the TECHQuest PA headquarters. Red Privet’s usability lab was conceived after we were asked to conduct a usability study on the website of a major consumer products firm in the Central Pennsylvania region. There wasn’t a suitable lab within 100 miles! More importantly, we discovered that big-city labs come with big-city prices. Adding a lab to our customer experience design practice just made sense. Our lab provides a convenient, neutral setting for testing mobile apps, websites, web applications and social media products in all stages of development – from paper prototypes, wireframes, HTML prototypes and beta sites to live sites and applications. We offer this as a full turn-key service including participant recruiting and screening, test plan development, findings analysis, as well as both immediate and long-term recommendations. In addition to product testing, marketing professionals can use the lab to conduct market research activities including focus groups, product observation or taped interviews. Red Privet also offers a full suite of user research, strategy and design services for web and mobile based products and services. Through our testing software, every participant click, mouse movement and click can be observed. An additional camera captures each participant’s behaviors and facial expressions so observers can see each reaction. For your convenience we offer real-time observation at our studio, we’ll even provide lunch or light refreshments. If you’re too busy or have remote team members, you can also view the test from your location (streaming real-time). DVD recording of all participant sessions are also available. Usability testing is an affordable way to find out what’s good, what’s not so good and what’s missing from your product or service. It can be performed as part of your design process, before you write code and market the product. We have experience testing as-is products to determine where they are succeeding and where they are failing. We also like to test as part of the design process whether you have sketches (paper prototypes), wireframes or functional prototypes. Usability testing reduces risk in your design and development process by identifying major issues and innovations before you go to market. 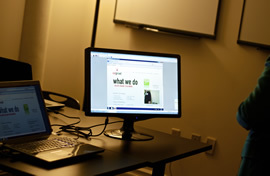 To learn more about Red Privet’s usability testing services or to reserve the lab, please contact Red Privet at (717) 884-9733 or info@redprivet.com.